I have been pretty open about my warlock hate. Stemming from leveling a holy pally and now a resto druid, any class that purposely reduces their health gets my scorn. I understand that it’s just a class mechanic and logically it shouldn’t affect me so much. One rejuv is usually more than enough to bring back a life-tapping-happy lock back to full or keep up the crackhead running around Hellfiring things. And I will give a shout-out to the locks who know about and use their Soul Harvest. I don’t know if I just pick on warlocks because a lot of them are bad or because I focus on each one just waiting to find something bad about them to mock. 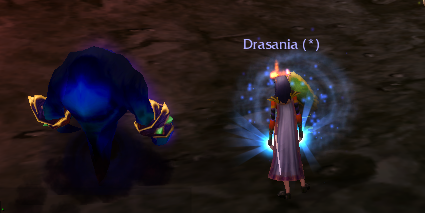 I don’t remember the last time I noticed a mage who was wanding, but if I see a warlock wanding I scream about it in guild chat. Maybe I hate them so much I love them? Or I love them so much I hate them? 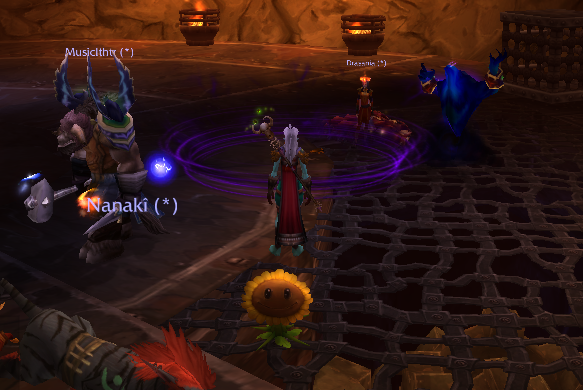 For now my goblin lock just hangs out in Org, doing a little alchemy. Actually, that reminds me that I can’t level up his alchemy anymore until he levels up. Whoops. It might be time to throw him out into the world. Maybe even a few instances. He certainly can’t be any worse than the lock my druid was healing the other night. Let’s review. The voidwalker is an excellent minion to use in instances. 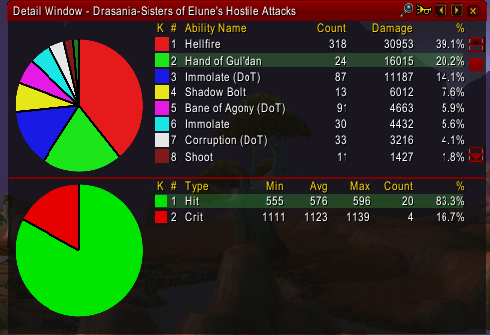 And this was BRD, not some lowbie instance where like Ragefire where it’s someone’s first time. Well, I suppose someone could have waited until level 50 to start. And, no, I didn’t cover the name but that’s more out of laziness than a desire to mock them. Another look at the VW. There’s no point to another pic except this one has my sunflower in it. Between the lock and myself, I had the better pet out. The hellfire at #1 makes me weep, of course, but it’s the wanding (Shoot) that makes me giggle. Yes, it’s only 11 but why do it at all? Aren’t there better finishing moves available? Ahh, sweet warlocks, I almost hope pugs keep playing you so funny so I continue to have things to mock. The last few days I have noticed that there are times when I get super laggy and slow and can barely move around. This isn’t very usual, even with my crappy computer. Granted there are situations where I don’t have the best performance–such as raids–but for the most part it’s just something I’ve learned to work around. But now when I slow to a crawl, I have only to look in the corner. Yay, red latency. I’m used to the occasional red latency but lately it seems like I’ve been getting it more and more. What’s especially annoying is I seem to get it now that I’m leveling my healer. It’s one thing to have a terrible connection when I am DPS; it’s pretty impossible to deal with when you’re trying to keep everyone alive. I was debating getting back into raiding now that Glee is over for the season. Go ahead and mock me if you want, bitchez. Unlike Sorak and his hidden Oprah obsession, I own my ridiculous television watching habits. So with my Tuesday now free and that being raid night I accepted as Tentative. I’ll go if they need me/have room but I won’t push myself in. If I go it would only be my 2nd time in a Cata raid. As it turns out I did end up going and it isn’t so bad at first. The troubles don’t start until Magmaw. I figured it would be slow thanks to all the mechanics going on and all the parasite adds. But that’s when the latency decided to go haywire. It would be fine, then red, fine, then red. I never knew when I would be able to move or when I would be frozen. I’m sure I missed the timing on pretty much every flame pillar. By Maloriak I was on constant red. I wasn’t even paying that much attention to the boss or the raid at that point so I whispered that I would need to leave if there was a replacement online. Anyone else would have been an upgrade, even someone’s level 6 bank alt. It’s a good think I was a little pissed off because a part of me thought it might be silly to call. “Excuse me, my game is slow.” I wondered if they rolled their eyes whenever someone complained of slowness. I felt I had a legitimate complaint; I just didn’t know how seriously they would take it. When I told him my internet was being slow, I got the standard “oh I’m so sorry to hear that” only this time accompanied by a “Mr James”. Every time he addressed me it was as Mr James. Awesome. We started off by doing a speed test. “Michael” confidently tells me “you should be between 2 and 3, Mr James.” He seemed shocked when I tell him I am at .96. “That’s too slow, Mr James, you should be between 2 and 3.” I don’t really know what these units of speed are but I know I should be between 2 and 3. I was tempted to ask “Michael” but, ironically, our phone connection was not that great. Oh wait, I think I’m supposed to pretend this is not an overseas call. After we’ve tried the time-honored-no-fail computer repair solution of deleting cookies and restarting with no increase in speed, “Michael” concedes that there is a problem and that he will put in a “rush” for a service technician. All I have to do is be home between the very specific hours of 8am and 8pm. I guess I should be grateful this timeframe wasn’t spread out among multiple days. Thankfully, the service tech shows up at 10 am. By that time I’ve been thinking this issue over and I’m pretty sure he isn’t going to find anything. I work from home, so I am using internet during the day. Because I use a work computer, I usually have another computer on for various non-work browsing. Even with both computers running, I rarely have any issues with internet during the day. I sometimes have issues on weekends, but it hits me that on the weekdays most of my latency problems occur at a specific time of day. Starting from about 6pm until about 11:30pm. If I am still playing that late, usually I can play pretty normally again by then. 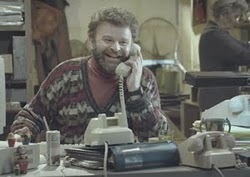 While the tech is fiddling away, I get a phone call from AT&T. Unfortunately it is not my new bestie “Michael”, but someone with a more…native…accent who has done some additional investigating. My suspicions are confirmed when he says that there is an issue in my area where the demand for services at “peak time” is exceeding what they can currently handle. Uh-huh..interesting. For my patience they would like to offer $10 off my bill a month for 12 months. Again interesting. Without my demanding they are lowering my bill. For a year. Which tells me this is either not a priority or it’s something they don’t foresee being able to fix anytime in the immediate future. The rep on the phone asks to speak to the tech still at my house, presumably to call him off. When he hangs up I get another explanation on the sudden increase in activity. Apparently there is more demand now that people are using Netflix and doing a lot of gaming. Gaming? You don’t say? I try to look innocent and shift my eyes anywhere but on the World of Warcraft mousepad the tech is standing 2 feet away from. Those hours of low speed do coincide with potential raiding. I’m not a regular raider so it’s less of an issue if I’m not there, but it’s terrible that it happens now that I was considering getting back in. I may end up switching providers but that is something that will involve more decisions.